In the 17th century, the British scientist Isaac Newton let a sunbeam pass through a slit in some wooden shutters and fall onto a prism. He was interested to see that the white light appeared as a rainbow-coloured band on the wall, whereby each colour had been bent to a different degree by the prism. He then wondered if this effect could be reversed. He therefore passed the multicoloured light through a second prism again that was placed upside down. A white beam of light appeared again. Newton had proved that white light was made up of multicolour rays. At the beginning of the 19th century, William Hyde Wollaston continued Newton’s optical experiments with sunlight and used ever smaller slits through which the sunlight could pass. He noticed dark, narrow bands within the rainbow colours that were devoid of any colour. However, his observations were ignored by the scientific community. Again in the early years of the 19th century Joseph von Fraunhofer developed a diffraction grating with grooves at intervals of 0.003 mm. This grating worked in a similar manner to a prism, i.e. it broke white light into spatially separate colours, but in doing so achieved a greater resolution of the individual colours. In the year 1814 Fraunhofer took up Wollaston’s work again and described the Fraunhofer lines of the solar spectrum that were named after him. John Herschel investigated the way different salts behaved in flames. In 1832 he observed different colours that he used for experiments. Like John Herschel, Robert Wilhelm Bunsen also worked with flame colours. 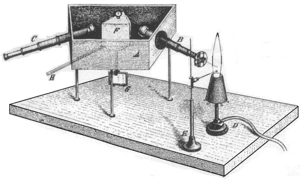 In 1859 Bunsen and Gustav Robert Kirchhoff discovered and explained the reversibility of emission lines, which is expressed in the first law of emission: “Every body absorbs the same radiation type that it emits when energised.” As a result they were able to identify the Fraunhofer lines as absorption lines of gases (hydrogen) and also explained the origin of Herschel’s flame colours as a characteristic property of the atoms vaporised in the flame. Their publications laid the foundation stone of qualitative spectral analysis that permitted the detection of chemical elements. In 1882 Henry Augustus Rowland improved the production of reflection gratings and created a concave grating. Spectrometers fitted with a Rowland grating did not need a lens to focus. The only optical element was the concave grating. The entrance slit, grating and observation (detection) plane are all on a single circle, the Rowland circle. The physicist Friedrich Paschen and the mathematician Carl Runge used Rowland’s work and at the beginning of the 20th century developed today’s popular polychromator spectrometer mounting (Paschen-Runge configuration). Early spectroscopic devices for observing solar and flame spectra consisted of an entrance slit, lenses, prism and an observation screen. The light passing through the narrow entrance slit (S1) was broken into the different wavelengths by the prism (P). With the help of the lenses (L1 to L3) these wavelengths were focused on a screen on which several coloured images of the entry slit would become visible: the emission lines. While these emission spectra were originally only observed with the naked eye, photo plates were later used that were mounted at the focal plane of the device. The photo plates were then exposed by the incident light. The intensity of the emissions were reflected by the strength of the emission lines. These early spectroscopic devices later resulted in the spectrometer, a machine that made it possible to determine the quantitative and qualitative composition of an analyte. This is also made evident by the name of the method: devices that work on the basis of quantitative analysis methods are called spectrometers. When you see the photo plate, it is easy to understand where the term “spectral lines” comes from. It was then discovered that when using spark spectrometry, many important emission lines lie outside of the visible range in the adjacent UV range down to 200 nm. In contrast to the human eye, photo plates can detect this range. Spectrometers of this kind were therefore fitted with UV-permeable optical components (quartz glass). As radiation below approx. 200 nm is absorbed by air, it was necessary to either create a vacuum within the spectrometer using a vacuum pump or fill the device with a transparent gaseous medium (argon or nitrogen). This so-called vacuum UV range made important emission lines for P, S, N, O and C accessible and with that defined the bandwidth range of 110 nm to 800 nm used today. The American H. A. Rowland made an interesting discovery at the end of the 19th century. If one attaches a dispersion grating (G) to a concave, mirrored surface, the grating takes on two important properties: it firstly disperses the incident light according to wavelength and focuses the image of the entrance slit (ES). If one mounts the grating and the entrance slit on a circle, all wavelengths appear on this circle without needing any further optical elements (Rowland circle). This mounting method has advantages regarding wavelength stability and light output. The light output can be further increased by using blazed holographic gratings. Nowadays, it is practically only emission spectrometers that use gratings as the dispersing element. In the field of spark spectrometry, Rowland gratings and Paschen-Runge mountings are common. Using photo plates as detectors, which remained common practice up until about the 1950s, made it possible to record the entire emission spectrum. Being highly sensitive, photo plates react to even the tiniest amount of light. However, they also go hand in hand with a complex analysis process as a separate photo plate has to be developed for each analysis, thus precluding speedy production control. 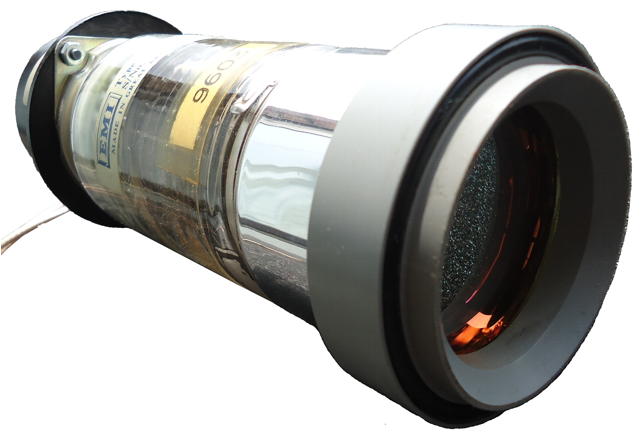 From about the 1950s onwards, photomultipliers (PMs) started to be used. A PM generates and intensifies electrons from entering photons. The emission spectrum can be recorded with only one PM (scanning monochromator). Alternatively, every relevant wavelength position can be fitted with an exit slit, through which photons are directed to a PM that is optimised for the given wavelength range. The resulting photocurrents are integrated into capacitors and generate a voltage that is proportional to the amount of entering light. The electrical signals can be processed immediately and the measured values digitally displayed. With the advance of computer technology, it was possible to convert these measured values into concentrations for on-screen display. This innovation gave rise to a quick and precise detection method covering the entire spectral range that was suitable for performing routine analysis tasks. Provided they are suitably calibrated while the spectrometer is being constructed, numerous element channels can be recorded simultaneously using photomultiplier systems. In the more recent past, electronic spectrometer components were improved with the help of semiconductors and greatly reduced in size. As a result, semiconductor-controlled excitation generators are used by now that contain no wearing parts. Spark spectrometry has become established as an important quality control element in the production of metals and alloys. During the last 20 years, increased effort has gone into automating the analysis process: sample preparation, sample transport, analysis and transfer of results. Modern spectrometers are also increasingly capable of independently monitoring their own status thanks to the inclusion of intelligent functions. The elements marked in red in the periodic table shown below can be detected down to concentrations of only several µg/kg using spark spectrometry.